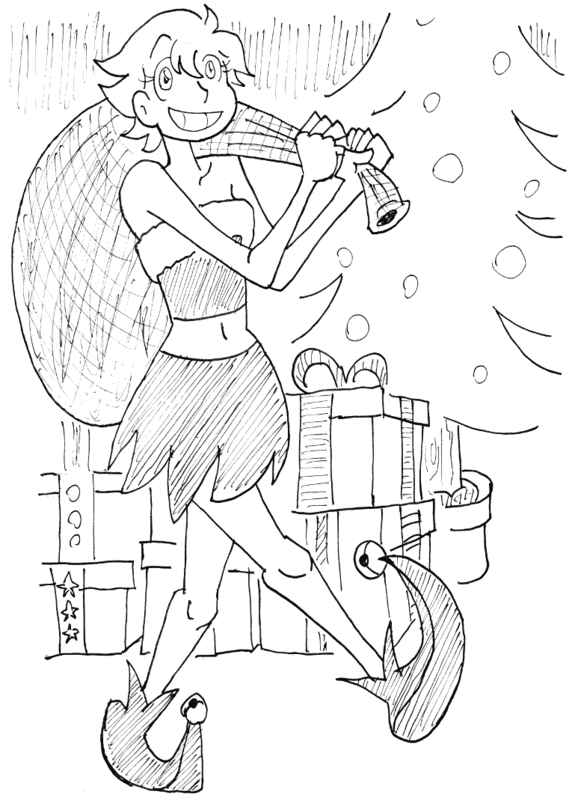 Thanks to the inspiring reminiscing of VeryCuddlyCornpone, I would like to propose an art exchange a la Secret Santa! Send me an email at nillace@hotmail.com if you would like to sign up for this, and I will secretly arrange the contributors around. The first-wave deadline for sign-up will be December 7th, 2017, and the art should be posted in this thread on (or around) January 1st, 2018. If people show up later than the December 7th deadline, then I'll make a second-wave series with a later publishing date. Your sign-up email should include the name you wish to have a piece of art addressed to, as well as a website URL of something like your webcomic, art gallery, Youtube channel, etc. Something personal, so the one giving you a gift can learn a little about who you are. Art gifts do not need to be holiday- or winter-themed, but it would be ideal to have your gift be appropriate to the individual you're sending it to. 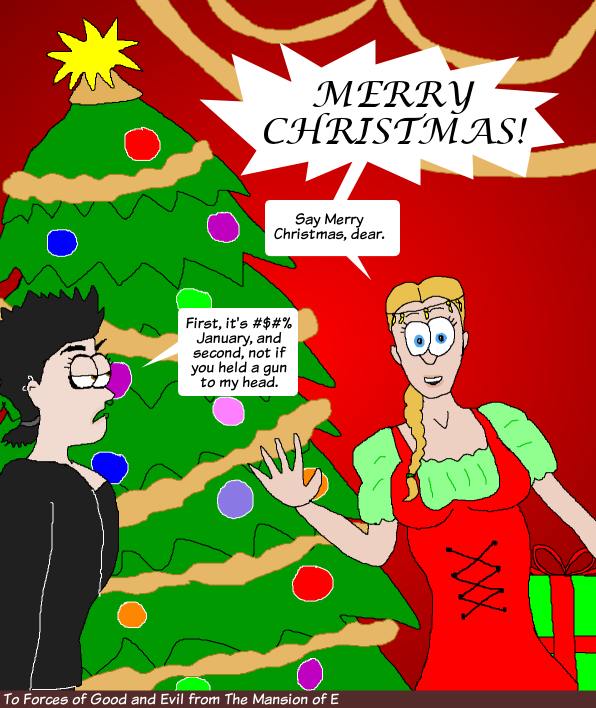 Ho ho ho, and merry upcoming wintertimes! Wow, thanks for setting this up! I'll send an email once things calm down around here. I appreciate it! Regrettably it doesn't appear we've had any sign-ups yet. There's still a week before the first deadline, though, so mayhaps people just need a little reminder. HEY! We've got some activity now! Huttah! Could certainly still use more, though. As the saying goes: The More, The Merrier . . . which is oddly more apt during this season . . . It's come down to the wire, but we've actually got some participants! If anyone else was on the fence about signing up, now's the time to commit! Could you imagine: "Companion Companion Companion!" The First Wave is away! 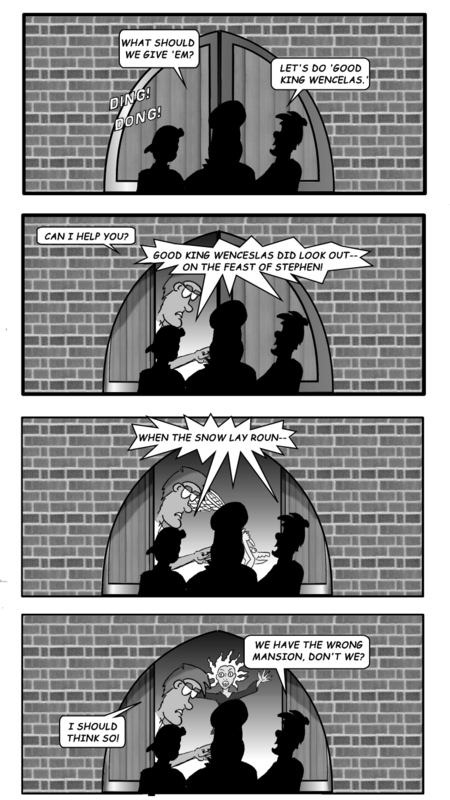 Our participants have been assigned their targets.
. . . wait, this isn't the Webcomic Secret Assassin . . . hmm . . . we should do that again . . .
Our participants have been assigned their . . . giftees? Yeah. We'll go with "giftees." Second Wave sign-up deadline will be scheduled for December 17th (or whenever / if-ever we get enough sign-ups for another wave; details pending). Completed images will be posted in this thread on January 1st, 2018. Three low quality prostit- er . . . "ho ho ho!" Real Life issues kept me away from Round One, but if you need one more participant for Round Two, I'm willing. Just send me an email at the address above, 'duck, and we'll get you primed and ready! This outfit is not historically accurate. Why now; that's not secret. That's not secret at all! Nice work, Cope. Thank you for participating! I hope everyone else in the first wave has their drawings done soon. I might have put a little too much time on this than necessary...but it was fun! Yes! That’s the first time I’ve seen one of my characters in motion. Thankya, phil! You're welcome! It was fun to use what I'm currently doing for work in a fun context like this. Yessss! 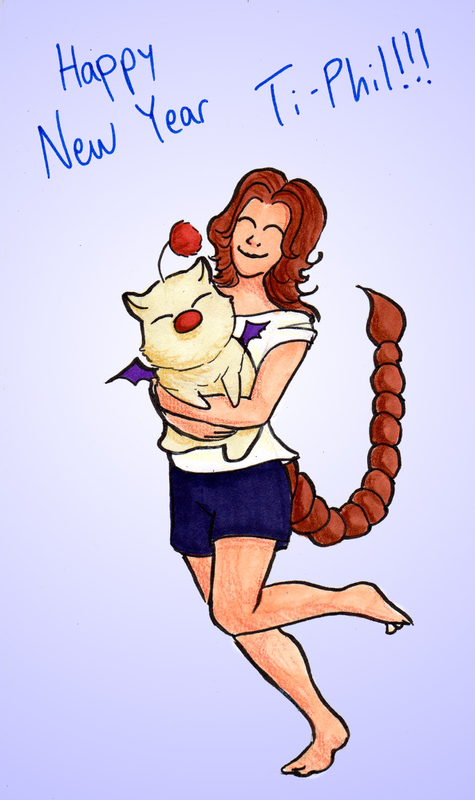 You capture's Scorpio's exaggerated love for moogles perfectly! Thanks Cuddly! A "thank you" to all the first wave participants! I'm happy to see you all shared in the holiday joy this season. Second wave should be posting soon'ish. Stay tuned! Geoduck! That is hilarious! Thank you so much! Here is mine! See? The community /can/ still come together! and a merry thanks to the second-wave as well! That concludes 2017's Keenspace Secret Santa. Twas a joy to have all this sharing take place.